Firstly, is your meter working properly? Inside in a dark room, close the rear baffle and hold your hand over the cell. The needle should read 0. If not, you may need to adjust the zero corrector on the rear of most models. Now, use the meter outside and make sure it adheres fairly accurately to the "sunny f16" rule. This says that with the shutter speed of the reciprocal of the ASA film speed, the aperture will be approximately f16 very sunny clear sky, f11 hazy sun, f8 bright cloudy, f5.6 dark cloud. If you can find a clear north cloudless sky and point the meter at it, it should read f16 or even f22. Cells often get "lazy" and with older meters will not get to f16 or anywhere near. If the needle doesn't move at all when exposed to bright light then most probably the cell is dead. 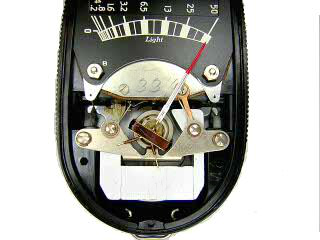 If you wobble the meter around and the needle doesn't move at all then the galvanometer may be stuck - see picture below. At your own risk, a little shaking and tapping against the palm of your hand may free it. This is the interior of a Weston II - other Masters have similar but not identical mechanisms. If the meter seems to work but does not give correct exposures, are you setting the film speeds right? Up to the Master IV the scale is foot candles, now known as lumens. After that it was an arbitary scale. The most frequent questions we are asked are about repairs. Repairs are expensive if carried out professionally (£90 plus) and difficult if you do them yourself - you may want to think seriously about buying another meter on Ebay! Spare selenium cells are are not easily available and may well not fix the problem on their own. Our FAQ has a section on repairing. In the US, Quality Light Metric - 6922 Hollywood Blvd, Suite 210, Hollywood, Calif. 90028 (323)467-226 is well thought of. Many of these manuals are links to the excellent website run by Mike Butkus. I know Mike would appreciate a $3 donation via Paypal (button below) for the use of these manuals (even if not his) so that he can buy more for us all to benefit from, and I would encourage you to do that - either using the Paypal link below, or via his website. These manuals are for your personal use only and must not be re-printed or otherwise distributed for sale. We will take-down within 10 days (but normally 24 hours) any manuals where we may have inadvertently used material to which you hold the copyright as interpreted under UK law - just leave a note in our guestbook. Weston Master Universal S74/715 - Thanks Malcolm! Weston Master V or an alternative very clear version.